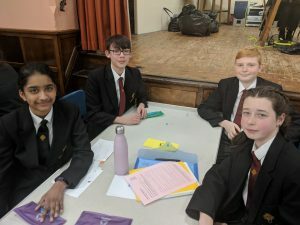 On Monday 25th March, myself and 3 other students got the opportunity to compete in the UKMT Team Maths Challenge at Heddon-on-the-Wall. The competition combines communication and teamwork skills and helped us develop our knowledge of mathematics. There were 4 rounds; relay, shuttle, group and cross number and in each round the questions were really difficult. They definitely challenged us and allowed our brains to think! At the end we came 10th out of 25 schools but I really enjoyed the day and it was an amazing experience. Our team was Tanushri Puthalapattu and Olivia Hearn from Year 8 and Sam Telford and Sirio Pozzi from Year 9.